Painful Ears: what do we know? – Oregon Tinnitus & Hyperacusis Treatment Clinic, Inc. When patients call my clinic to request an appointment and mention ear pain, then the focus of the visit shifts from a regular evaluation. Ear pain or OTALGIA is a problem that plagues a smaller number of otherwise generally healthy people including children, and is often related to loss of sound tolerance, hyperacusis and can be acconpanied by tinnitus. Ear pain deserves its own investigation by a variety of specialists including but not limited to otolaryngologists, otologists, neurologists, plastic surgeons who use various medications as injections for affecting head muscles and tissues, audiologists and others. There are two issues that require exploration with these patients: the loss of sound tolerance (decibels and volume) and the pain issue. Many times the person believes that hyperacusis IS painful, and this is simply not the case for the vast majority of those with hyperacusis. Sounds are just too loud. Too loud does not mean painful. Too loud is just too loud, overwhelming, sounding amplified, we KNOW it is too loud and we clap hands over our ears and flee. But ear pain, otalgia, is different. People report ear pain without sound. Aching pain, deep in the head, sharp ice-pick type of pain with certain tones or noises, severe unremitting constant pain that is very difficult to treat…..pain needs to be analyzed and differentiated from the state of feeling life is just too loud. Most pain-hyperacusis patients get lumped in with the tinnitus group which is much much larger, and all treated the same. This is not a good idea as certain tests like the LDL test, or reflex tests, or residual inhibition tests, can trigger a patient’s pain mechanism and cause distress. Often long after the appointment is over. 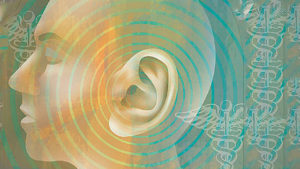 Everyone who has ears that hurt should therefore use caution in testing situations and find out how loud certain parts are, choose whether to do those parts, and work with someone who will pay close attention to the gray-zone areas where pain can begin, i.e., moderately loud tests even at conversational levels. The treatment for painful ears varies: for many, TRT did not result in the recovery of the patient. Pain can be from the outer ear or the middle ear. The cochlea cannot transmit pain signals so the middle ear with the chain of bones, the tendons that hold muscles to the bones, the joints of the bones, the eardrum, and the important network of cranial nerves located in the middle ear space along with the jaw joint that extends right there in the same tiny area, are all potential points of origin. Approaches that have been tried include massage, dental interventions, plastic surgeons or others injecting Botox into key areas, steroid injections or infusions into the middle ear space, surgical removal of the tiny muscles or clipping of tendons that hold the muscles to the bones, and manipulation of spine or neck by chiropractors. Pain medications appear to be helpful in some cases but difficult to manage as the pain can be quite intense. Pain clinics work with these patients as well to try different approaches including mindfulness and drug applications. This is a very difficult condition and it is hard to see young children with it who feel such intense pain in those little ears! Several cases at our clinic included one who fell while playing in a heap of kids and his spine was affected as well as one of his ears, and another who had a reaction to an immunization and ended up with severe bilateral otalgia that no doctor could affect. Most of the adult cases can be related to noise trauma or mild brain injury associated with accidents or falls. It would be such a gift if research focus on this condition could proceed and discover how to improve this group.